Professional cosplayers aren’t exactly a rarity, these days. Professional wrestlers who also cosplay? There aren’t many of those. In fact there’s probably only Kenny Omega. Personifying better than anyone else the ‘curious but actually makes total sense when you think about it’ crossover between geek culture and pro grappling fandom, Omega is not only one of the best in the business, having enjoyed a hell of an international career trajectory since his debut in 2000, but he is also proudly, defiantly, a great big fanboy. His YouTube channel is dominated by recordings of his Street Fighter matches. He’s used Mega Man themes as his entrance music. He’s used a Final Fantasy-nodding finisher called the One-Winged Angel. He’s appeared dressed as Liquid Snake. 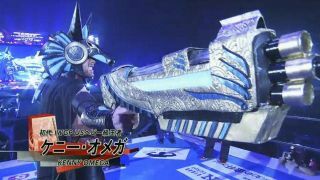 And now, for his latest appearance at New Japan Pro Wrestling’s Wrestle Kingdom 12 event, he’s given us possibly the best thing to come out of Destiny 2’s disappointing Curse of Osiris expansion by turning up in a costume inspired by the titular Warlock (in truth mashing up the character's look with the first game's Anubis-inspired armour), packing a home-made recreation of the Vigilance Wing Exotic pulse rifle. I’ll dodge mentioning the result of Omega’s no-disqualification match against Chris Jericho, because it only ended a few hours ago. But while you wait to catch up, would you just look at the quality of his get-up in these pics (found on Reddit, via Hova092, HAYABUSA_DCLXVI, and MakeEmSayWoo)? While the gun and the costume are tweaked just enough to not entirely infringe copyright, they’re one hell of a good recreation, and would probably get just as much photographic attention were Kenny simply a nameless nerd wandering around Comic Con. Rather than, you know, one of the best wrestlers working in one of the best promotions around. Looking for more details on the big man? Check out this meaty interview we ran with Omega a couple of years ago.